Welcome to the NAFSA Research Connections Community! Here we explore—and encourage discussion about—scholarship, reports and news articles on topics related to global learning, internationalization and the higher education context. Find bibliographies (compiled weekly and monthly under the library tab), thought pieces, and, with your participation and contributions, insightful reflection on wide-ranging issues. Whether a student, faculty member, study abroad adviser, international student services adviser, senior international officer, immigration specialist, or all (or none) of the above, come share with us what you are reading, researching, and thinking. Click JOIN to make sure you receive the weekly e-mails and discussion posts. Registration is now open for the upcoming Spring 2019 Research Symposium which will be held at Loyola University Chicago on Friday, April 26, 2019. Registration will close on April 10th. 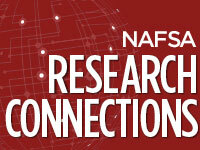 A preliminary program with presenters' abstracts is available via the NAFSA Research Connections library here. NAFSA gratefully acknowledges Loyola University Chicago for their partial support of this event.